On Saturday night , February 17th , 2018 the Midwest's Premier MMA Promoter "XFO MMA" once again held the extremely poplar and fan favorite event "XFO # 62 " at the Harley-Davidson dealership which is located in Woodstock, Illinois....I love going to MMA matches at this venue, the fans , the bikes makes for a amazing night of MMA action. Below the cover photo of " Brian Peterson vs Jason Belyew" is a slideshow which contains my favorite images of the night . Please NOTE THE SLIDESHOW'S ARE NOT THE COMPLETE PHOTO GALLERY POSTING OF ALL IMAGES CAPTURE DURING THE XFO EVENT BUT MY FAVORITE IMAGES OF THE NIGHT. TO VIEW THE COMPLETE PHOTO GALLERY POSTING ON THE TOMBA-IMAGES COMMERCE SITE, LOCATE LINK BELOW SLIDESHOW. To view the above image of "Peterson vs Belyew" in a full screen Lightbox , click on image. This Art image is available in a 16" x 20" format, contact Tomba-Images for information. Below slideshow contains Tomba's favorites from each match plus. To view the complete photo gallery posting on the Tomba commerce site, please locate the link below the slideshow. 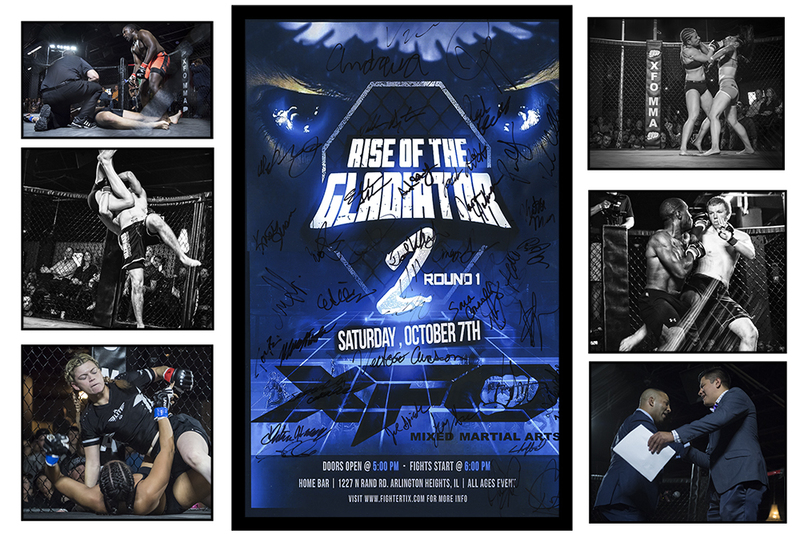 To view the complete Photo Gallery of all folders containing all the images captured at the XFO # 62 Fight Night, please high-light and right click the below link. Mark your calendar for March 2nd, 2018 for the Hitz Boxing Night Fight at the Belvedere located in Elk Grove Village, Illinois.....then its the Illinois 2018 Hall of Fame Induction Ceremony on Saturday March 24th at the Abbington Banquets 3S002 Illinois 53 in Glen Ellyn, Illinois. Please contact Tomba at "tom@tomba-images.com" or call/ text at 630-258 8930 if you would like information regarding these events. To view in a Lightbox click on image. If you are interested in purchasing this calendar this calendar, the price is $24.00 plus shipping. Unfortunately, I can not offer the 35% fighter discount on this item. My cost is $14.00 a calendar and with adding only $10.00 per calendar for my photography and design time making the price of $24.00 there's just no room for further discounts. If someone chooses to have their fight night or weigh-In image on the front cover , there would be an additional charge of $12.00. The plan is to order calendars by next week on Friday January 5th, 2018 . Please let me know if you wish to order any calendars by next Friday. Orders received after January 5th will incur an additional charge, if your interested in ordering do so within the week.